What Are the Reactants & Products in a Combustion Reaction? Combustion is an oxidation reaction that produces heat, and it is therefore always exothermic. All chemical reactions first break bonds and then make new ones to form new materials. Breaking bonds takes energy while making new bonds releases energy. If the energy released by the new bonds is greater than the energy needed to break the original bonds, the reaction is exothermic. Common combustion reactions break the bonds of hydrocarbon molecules, and the resulting water and carbon dioxide bonds always release more energy than was used to break the original hydrocarbon bonds. That's why burning materials mainly made up of hydrocarbons produces energy and is exothermic. Combustion is an exothermic oxidation reaction, with materials such as hydrocarbons reacting with oxygen to form combustion products such as water and carbon dioxide. The chemical bonds of the hydrocarbons break and are replaced by the bonds of water and carbon dioxide. Creation of the latter releases more energy than is required to break the former, so energy is produced overall. In many cases a small amount of energy such as heat is required to break some of the hydrocarbon bonds, allowing some new bonds to form, energy to be released and the reaction to become self-sustaining. In general terms, oxidation is the part of a chemical reaction in which the atoms or molecules of a substance lose electrons. It is normally accompanied by a process called reduction. Reduction is the second part of the chemical reaction in which a substance gains electrons. In an oxidation-reduction or redox reaction, electrons are exchanged between two substances. Oxidation was originally used for chemical reactions in which oxygen combined with other materials and oxidized them. When iron is oxidized, it loses electrons to oxygen to form rust or iron oxide. Two iron atoms lose three electrons each and form ferric ions with a positive charge. Three oxygen atoms gain two electrons each and form oxygen ions with a negative charge. The positively and negatively charged ions are attracted to each other and form ionic bonds, creating iron oxide, Fe2O3. Reactions not involving oxygen are also called oxidation or redox reactions as long as the mechanism of electron transfer is present. For example, when carbon and hydrogen combine to form methane, CH4, the hydrogen atoms each lose an electron to the carbon atom, which gains four electrons. Hydrogen is oxidized while carbon is reduced. Combustion is a special case of an oxidation chemical reaction in which enough heat is produced to make the reaction self-sustaining, in other words, as a fire. Fires in general have to be started, but they burn by themselves until they run out of fuel. 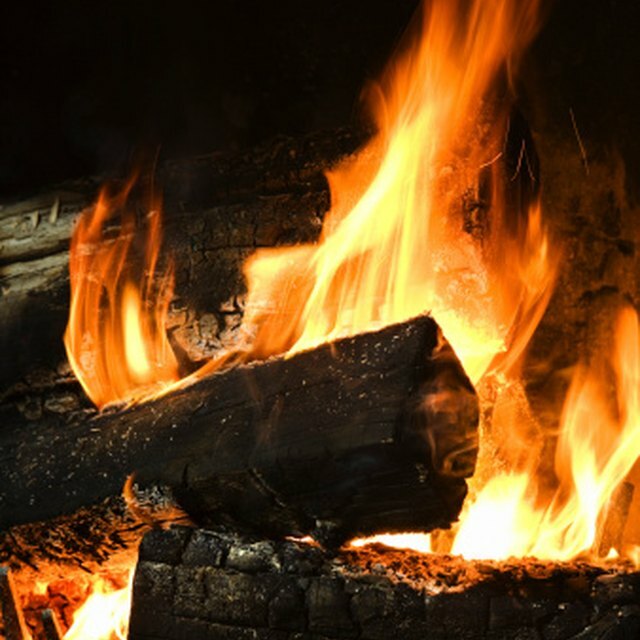 In a fire, materials that contain hydrocarbons, such as wood, propane or gasoline, burn to produce carbon dioxide and water vapor. The hydrocarbon bonds first have to be broken for the hydrogen and carbon atoms to combine with oxygen. To start a fire means providing the initial energy, in the form of a flame or a spark, to break a few of the hydrocarbon bonds. Once the initial starting energy results in broken bonds and free hydrogen and carbon, the atoms react with oxygen in the air to form carbon dioxide, CO2, and water vapor, H2O. The energy released by the formation of these new bonds heats the remaining hydrocarbons and breaks more bonds. At this point the fire will keep burning. The resulting combustion reaction is highly exothermic, with the exact amount of heat given off depending on the fuel and how much energy it takes to break its bonds. What is a Synthesis Reaction? Markgraf, Bert. "Are Combustion Reactions Exothermic?" Sciencing, https://sciencing.com/are-combustion-reactions-exothermic-13710438.html. 28 March 2018. What is an Endothermic Reaction?